Not strictly classed "entertainment", this bastion of British free public speech and free assembly can prove one of the most absorbingly unique, theatrical activities the city has to offer. 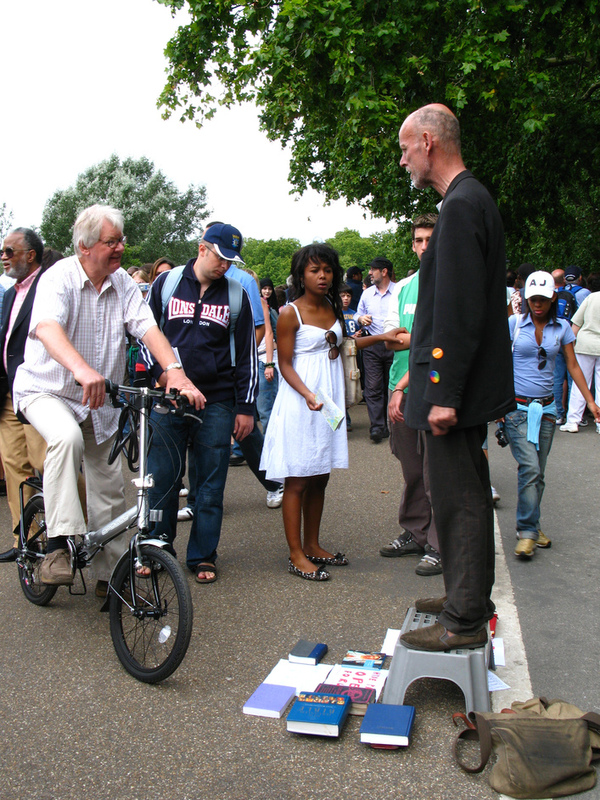 Located on the corner of Park Lane and Cumberland Gate, opposite Marble Arch tube, Speakers' Corner is the spiritual home of the British democratic tradition of soapbox oratory. Every Sunday since the right of free assembly was recognised in 1872 in the Royal Parks and Garden's Act, people from all walks of life have gathered to listen to speeches about anything and everything... and to heckle. From Socialism to Sunday trading, sausages to space invaders, the opinions aired here are varied and fascinating. While Karl Marx, Lenin, George Orwell, and William Morris have all used this spot to express their ideals and beliefs, your average speaker isn't quite as high profile. The coherence of the speakers also varies greatly, but as a whole it makes for great street theatre. Come and watch, come and heckle, or, if you have a burning desire to share your opinions with the world, come and spout - take something to stand on and start pontificating. Although Sunday morning is the best time to visit, speakers can now be found on the corner throughout the week. Best for: Marxism, Socialism, Capitalism, public protestations and pontifications, rants and ramblings. What are the best dining options near Speakers' Corner London? Speakers' Corner gyms, sporting activities, health & beauty and fitness. The best pubs near London Speakers' Corner. Speakers' Corner clubs, bars, cabaret nights, casinos and interesting nightlife. Where to have your meeting, conference, exhibition, private dining or training course near Speakers' Corner. From cheap budget accommodation to luxury 5 star suites see our discounts for Speakers' Corner hotels, including Amba Hotel Marble Arch from 79% off.